Before writing the content of an e-mail, you must appreciate that it is a privilege to address a group of exceptional people, who want to read what you are going to write (and they gave their consent to send it to them!). Do not disappoint them! Sit down and decide: Whom are you sending your text to? Why are you doing it? What do you want to achieve? Ann Handley, in her book “Everybody writes”, gives the following advice: Swap places with your recipient and write an e-mail you would open. This is a quite a universal principle worth implementing, especially when it comes to subject matter. According to the March 2014 report from Retention Science on research carried out on 260 million e-mails and 540 campaigns, e-mail subject lines that are 6 to 10-words long have the highest opening rates. The content of an e-mail should not be long either! Get straight to the point, especially as most recipients only see a notification on their phone screen, which means they will probably read only the introduction. Of course, there are exceptions to each rule. Among these exceptions, one will find legendary e-mails from Maria Popowa, the author of Brian Picking blog. Her entries are incredibly long, decorated with sophisticated illustrations and full of links to archived articles. Hit home when it comes to your client’s needs, but avoid words that may trigger spam filters. American spam filters ban such words as “free” and “lifetime”. Carolyn Nye, in her guidebook “Practical E-commerce”, advises us not to use such punctuation marks as “!” or “?? ?” and to avoid capital letters or the symbol “$”. Polish marketing specialists tend to criticise subjects that do not forecast the real content and encourage us to test a few variations. Irrespective of various surveys related to how the ideal subject of an e-mail should look like, we must remember that there isn’t something like an optimal subject, and it is crucial to use A/B tests that let us optimise our subject, says Paweł Sala, Fresh Mail managing director, in his guidebook “E-mail Marketing” published by IAB Polska (Polish department of Interactive Advertising Bureau from 2012). What about people who never open your e-mails? Take them by surprise! Such a solution is suggested by D. J. Waldow, the co-author of “The Rebel Guide to Email Marketing”, whose words were quoted by Ann Handley. Try to write something shocking, funny or scandalous, something that fits your brand best. Whatever you do – do the opposite! You can also (reasonably) use the so called Zeigarnik effect, taking advantage of the fact that people remember uncompleted or interrupted tasks better than completed ones. The recipient of such a message instinctively tries to find the sense in order to “close” the message. What if this does not help either? Well, Waldow says, Email works best when you speak to those who really want to hear from you. Delete! This is what, (after announcing it publicly), Polish branding specialist Paweł Tkaczyk does. He regularly clears his mailing lists from non-active users, and he calls those who stay, “little diamonds”. The power of personalisation lies in emotional engagement. It is worth mentioning the example of Paczkomaty InPost – the company delivering parcels to self-service automated lockers. When the number of sent parcels rose dramatically, their challenge was to make clients collect their parcels faster to make room for the next ones. The standard message clients receive when the parcel is ready to deliver was changed to: Hello, it’s your Great Parcel here. I’m writing from the Paczkomat locker. Well, I am quite well, but you know the saying, “East, or West, home’s the best”. Please, come and pick me up. Clients started to pick up their parcels significantly faster! Regularity and repeatability are vital for you, as a publisher, as thanks to these, your readers will expect your e-mails. Firstly, send e-mails regularly, at the same time. Secondly, think of various thematic cycles that will make readers wait for each subsequent part. Just as in the case of a good TV series. Now think what you can talk about endlessly and divide it into a few or even several parts. Maybe it will be a cycle entitled: “5 questions to… or about?” Your readers are curious who you are and what the details of your activity are. Encourage them to ask questions, for example in comments under your posts or via e-mail. Collect the most interesting answers and put them in your newsletter“, says Kamil Newczyński, Social Talk in “Guide to Successful Email Marketing for Bloggers”, published by Get Response, Polish e-mail marketing tool. Enrol for a free test? Download an excerpt from your latest e-book, report or case study? Make sure you explain it in a well-defined way. Below, is a piece of advice for those who are afraid that their efforts may seem unprofessional. 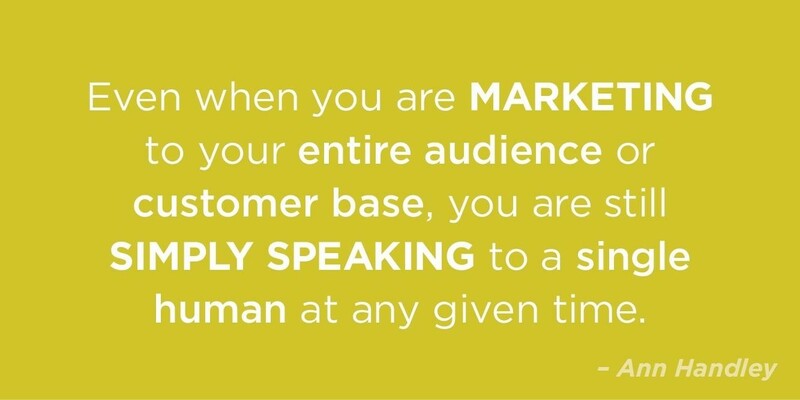 Ann Handley says, Even if you are marketing to your entire audience or customer base, you are still simply speaking to a single human at any given time.